For me a handbag is an investment. I’m not the kind of girl to have a million handbags; once I have a bag, I use it until the poor thing has no life left in it. I may spend a bit more on them, but I like that I’ll know they’ll last me a while before I have to buy a new one. For me my handbag is often my biggest accessory. For a fashion blogger, I’m not normally one for jewellery or ‘statement’ pieces and so my main feature in a look is usually my bag. I have a love for beautifully classic bags and on my way to striving for a classic Louis Vuitton or Mulberry, I’ve come across this beauty from Baginc. 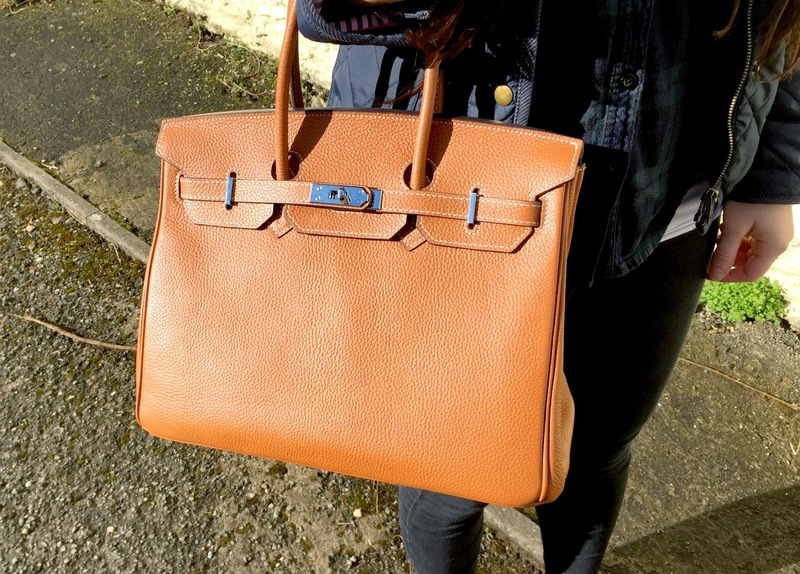 This is the ‘Essential’ Jane bag* in a lovely Leather Brown – definitely not too dissimilar from the Hermes Birkin Bag. As copy-cats go, this is a pretty decent bag. I absolutely love the style and find it a really lovely style for every-day use as well as for when travelling. The Baginc ‘Jane’ Bag is really pretty and well made, however I believe that it has one flaw. Although it looks gorgeous, it is very difficult to get into. All of the clasps and straps make the design sleek and very safe (for the security conscious) but as for practicality, that’s where this bag falls short. I’ve been using this bag for a couple of days now and even within the first 15 minutes of using it when out food shopping i found it really difficult to work with. The simple task of retrieving my purse or car keys became a massive struggle (as you can see in the middle picture above) and in the end I eventually gave up and began to just leave the bag un-fastened. 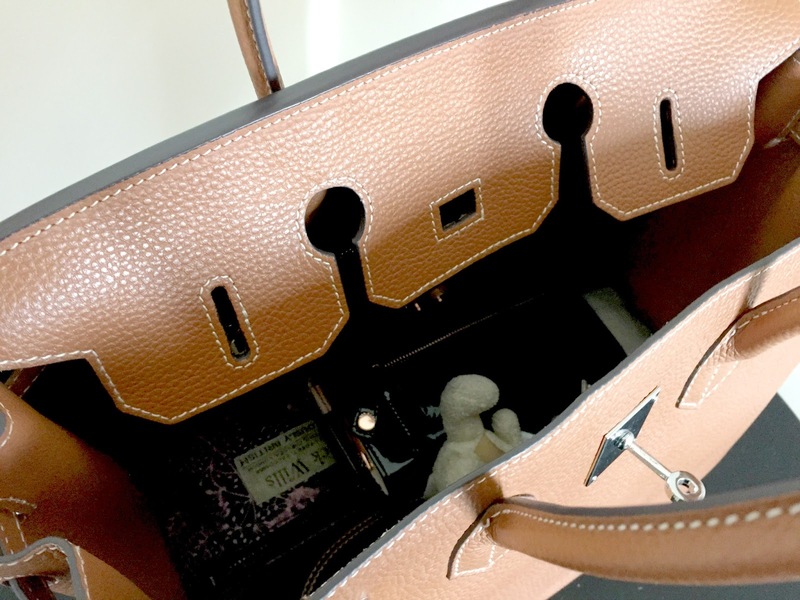 To constantly manoeuvre the bag’s opening flap through the handles and then fasten the straps through the metal detailing and then finally around the clasp, was a massive hassle and one that I became very frustrated with very fast. I absolutely adore this bag, but I think that a better design would have been to attach a magnetised clasp under the flap and against the main part of the bag, keeping the beautiful detailing and character of the bag, but eliminating the need for swear words every time you want to open or close it – If only I didn’t have to worry about opening it every five seconds to access my spare change! Apart from my slightly negative comments towards the fastening of this bag, I actually really liked it. When I used it and didn’t close it as often, it was a really decent bag, with a lot of room within. The bag itself has a large main pocket and after the straps that hold it closed retract the bag widens and becomes fully opened (think drawstring effect). The main body is really spacious and even after chucking in my daily essentials (purse, makeup bag, keys, phone, work pass) there was still a lot of room to fill. Even when I did have the patience to close it properly, I still didn’t struggle with it being too full, which is an issue that I usually have with smaller bags. Aside from the main pocket, there are also two separate pockets on the insides of the bag; one is open and ready for anything like a phone or your favourite lipstick to slip into and one is zipped shut (perfect for those lady products to be hidden discretely in). I really really like this bag, it’s just a massive shame that it’s not too easy to work with. I’m hoping that when the leather softens up a bit, it becomes easier to use, but for now I have to say that this seems like it could be the perfect bag to take on a trip. Aeroplane, coach, train, anywhere you don’t need to access your stuff quickly, you know this bag will keep your belongings secure and although I’d love to have it as an everyday bag and use it properly, at the moment I think the only way that I’d be able to use it, is with not fastening it up properly every time. Have you had struggles like this with bags before? You can buy the ‘Essential’ Jane bag here for $159. Gosh, as pretty as the bag is, I don't think I could deal with the fussiness when it comes to opening it! It's a lovely shape though, and looks like it would fit a lot in! My one and only handbag is the same colour, and I love it! It's a very versatile colour. what a beautiful bag! Couldn't deal with the clasps though! wow that would be really annoying! I'm definitely wanting function over design when it comes to a bag. Have you been using it much since you wrote this?